Ensure Your Products Meet The Highest Standards . . .
Establishing and maintaining high quality assurance (QA) standards is central to healthcare and life sciences organizations. Effective QA ensures quality in every aspect of the development and manufacturing process. We're experts in integrating technology solutions for ISO-13485 and ISO-9001 requirements management, compliance audit reporting, traceability and other special needs of the quality assurance unit. 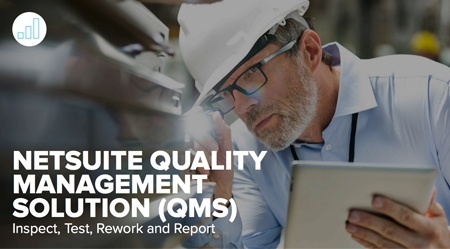 Download The NetSuite Datasheet For Quality Management Solutions Now! Quality assurance solutions make it easier to establish and maintain high quality standards. We're the QA experts. For over 30 years we've established quality assurance best practices through the integration of technology and process improvement. Our experts are focused on bringing clients into the future with cloud-based software and modern methodologies. Our experts have unique knowledge of the very specific demands on the Quality Assurance Team. We've worked with Medical Device Manufacturers to develop customized solutions, extending the capabilities of core ERP systems to address the needs of heavily regulated and reviewed compliance teams.